Today I have a guest post regarding travel in the UK – but the ideas mentioned below will apply to where ever you may travel this summer! Thanks to Kira for sending me this article. And you can find me guest posting today at Breanna’s site! It’s not easy, keeping the little ones entertained during the summer holidays, especially when you’re living to a budget that can’t really allow for exuberant treats. While most of the time, a stint away from home could be a feasible option if booked cheaply, it’s all the added extras that soon add up and push you over budget. The great thing about many UK destinations is that they don’t have to cost anywhere near as much holidays overseas and even less so if you’re a little savvy about your plans. Even enjoy a seaside holiday with Travelodge doesn’t have to cost an arm and a leg. Family rooms are often extremely affordable, without shirking on comfort, and placing you in the heart of your chosen resort. Whether you opt for Blackpool in the north or Brighton in the south, you will be able to enjoy a stint at the seaside for next to nothing if you’re smart about what you spend money on. The problem with many parents during the summer holidays is that they feel the need to spend, spend, spend on days out and excursions that will keep the kids amused. In reality, you don’t have to spend oodles of money for your children to enjoy themselves. An overnight stay by the seaside can make their imaginations run wild if you know how to trigger them and most of the time, getting the creative juices flowing doesn’t have to cost a penny. Find a local park or green area and take a picnic. If you’re driving to the seaside, take a hamper with you and fill it with sandwiches and pastries, fruit and juice that the kids (and you!) will love to tuck into. Pack a blanket to lie on the ground and take some games with you – perhaps a rounders set or a football for the little ones to run off some energy with? Give the kids a disposable camera that they can go wild with. Nowadays, they cost next to nothing to buy and less to develop than they did when we were young and they could provide your little ones with hours of entertainment. From photographing shells on the beach to leaves in the forest, they could record their own memories of the family adventure. Tree and leaf rubbing is a popular activity with little ones and the materials they’ll need are minimal. Take along some paints so that they can make some creative pictures using what they find – something that you can treasure forever. Enjoy walks along the seafront and, if the weather allows, a dip in the sea too! 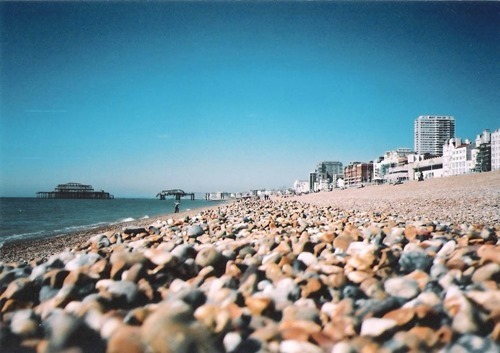 Brighton is particularly popular with paddlers during the summer and it doesn’t cost a penny! Head off for a spot of beachcombing, trawling the shore for some fabulous finds. Take along a bucket to collect the treasures or find a rock pool and enjoy some crabbing. See? So many activities and not an entry fee in sight! Make the most of your frugal seaside trip – you’d be surprised at all the amazing memories you’ll come home with.